Edward Crill completes the afternoon charting of the patient’s general condition and appetite, his temperature, pulse and respiration. Credit: Roger Schafer? 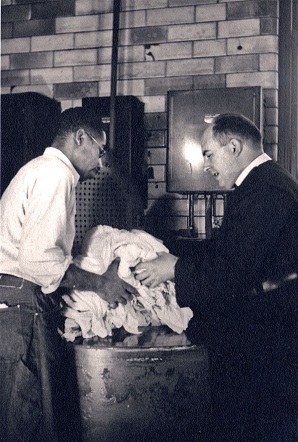 George Tuinstra removes a hotpack from the steamer prior to applying it to a patient’s leg. Credit: Roger Schafer? Herwythe Collings gives a patient his afternoon backrub. Credit: Roger Schafer? John DeRoo checks the speed of an intravenous infusion. Credit: Roger Schafer? 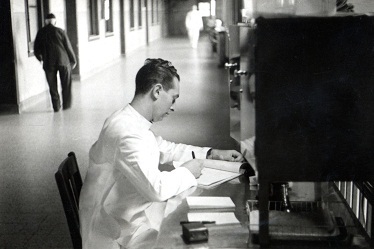 Roger Schafer, Alexian Brothers Hospital, Chicago, 1945. 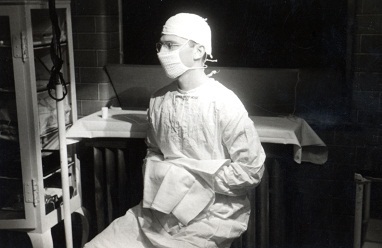 Theodore Kaap, now in his third year of training as an RN, waits in the Operating Room before assisting in an operation. Credit: Roger Schafer? Excerpt from "Servicemen in White"
CPS Camp No. 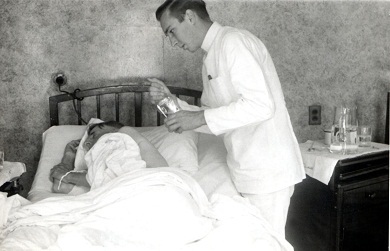 26, a General Hospital unit located at Alexian Brothers Hospital in Chicago, Illinois and operated by the Association of Catholic Conscientious Objectors (ACCO), opened in March 1942. When ACCO withdrew from CPS on October 30, 1945, the Brethren Service Committee operated the unit until it closed in April 1946. Most of the men served as nurses. Alexian Brothers Hospital in Chicago, Illinois was the first CPS hospital unit to open. The men, upon entering CPS, reported a mix of denominational backgrounds, including twelve Mennonite men in the unit. Some of the men were married. Most of the men in the unit served as nurses. The hospital only accepted male patients and all of the nursing personnel were male. The men published a camp newspaper Common Ground for CPS. The men also produced a yearbook Of Human Importance, a 32-page book with illustrations and photos describing the life and work of the unit that highlighted the training for the male nurses’ unit. Many assignees enrolled in a practical nursing course. Class time was counted as work. Qualified doctors and Brothers gave the instruction. Eleven members of the unit graduated from the Alexian Brothers School of Nursing. 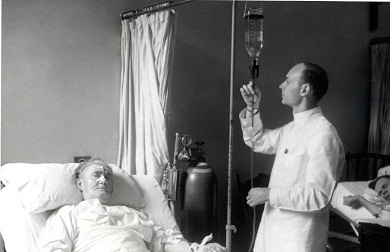 (Sibley and Jacob p. 190) Many others became familiar with advanced techniques such as intravenous injection and oxygen therapy. Unit members also studied Chinese language and culture in order to prepare for possible relief work in China. Lillian Pemberton Willoughby, the wife of one CO in the unit, worked for eighteen months as head dietician at the hospital. Since she earned $200 a month, she was able to support her family of three and hire another CPS wife for child care. (Goossen p. 84) By Selective Service Regulation, CPS men received only a small monthly allowance. When the Association of Conscientious Objectors withdrew from cooperation with the National Service Board of Religious Objectors on October 30, 1945, the Brethren Service Committee administered the unit until it closed. For information on public health camps and units, see Leslie Eisan, Pathways of Peace: A History of the Civilian Public Service Program Administered by the Brethren Service Committee. Elgin, IL: Brethren Publishing House, 1948. 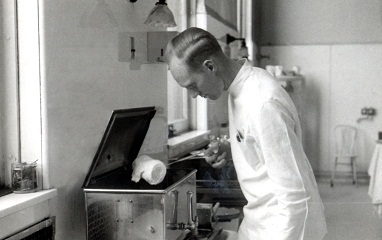 For more information on service in public health work, see Melvin Gingerich, Service for Peace: A History of Mennonite Civilian Public Service. Akron, PA: Mennonite Central Committee printed by Herald Press, Scottdale, PA 1949, Chapter XVII pp. 252-274. For information on education for peacemaking, see Mulford Q. Sibley and Philip E. Jacob, Conscription of Conscience: The American State and the Conscientious Objector, 1940-1947. Ithaca, NY: Cornell University Press, 1952, pp. 166-199. For more information on Association of Catholic Conscientious Objector camps, see Gordon Zahn, Another Part of the War: The Camp Simon Story. Amherst, MA: University of Massachusetts Press, 1979.